"Whether you think you can, or whether you think you can't, most of the time you're probably right." Let's say we have a fugue, or the start of one, and we're thinking of writing another work in free form to pair with and precede it. Using Bach as authority, the prelude paired with a fugue is worked contrapuntally, may use imitation and other learned (pronounced "ler-ned") devices, and may contain passages with running figuration, but has no thematic connection with the fugue the vast majority of the time, does not make use of fugal procedure, and it adheres to no specific form. It's happened before, that this sort of thing has led to the production of an effective, interesting work for the organ [See blog, Your Ideas], but it can be an awfully long wait, and this would be far and away the exception to the rule. Would it be better to find a private place along the ocean on a cloudy day where we can sit and wait for the clouds to part and that wonderful melody that we've sought for so long land on us like a ray of Light from heaven? ... we should all have it so good. No, the usual way this works is that we first have to sit down to a blank screen, or an empty bench, and do our work, turn things on, and let the Powers of Heaven observe us trying to create something fine and good and lasting and beautiful; this is what triggers those same Powers to send us the ideas and insights we're looking for. Here's an analogy: we can't expect that car or truck we own to take us across town merely by wishing it would and waiting for it to start itself; no, we first have to open the door, get in it, turn the key, and put the vehicle in gear; after that, the unseen forces of nature that make the vehicle operate kick in, and pretty soon we find that we're getting somewhere. I know, it's the darndest thing anybody ever heard of, to start working like this without an inkling in mind of what we have to work with and where we're going with it, but, this is the source, the very fountain, of a composer's inspiration. Here's another analogy: by making up our minds to sit in the cockpit of our airplane and refusing to believe the lie that, having taken flying lessons, we'll never learn to fly (never is a long time), and by taking our aircraft to the end of the runway, and by leaning on the throttles with no particular destination in mind, and persisting against Resistance ... the Lizard Brain or voice inside that keeps telling us to compromise our ambitions and, in effect, quit while we're ahead and park it in the hangar [See blog, The Book, The Lizard Brain, Parts I-VII] ... we soon discover that more unseen forces of nature have come to our aid, have lifted our wings, and have us airborne. Pretty soon we're finding ourselves looking down on the tops of the clouds from high above them, from a place we've never been before and we've never even dreamed of. That's how it works generally with composing; we just have to make up our minds to sit down and do our work starting with an empty head, and then, it never fails; ideas come, insights accrete, and the Powers of heaven, where creation has its home, come to our aid and give us the very ideas and theme(s) we need to proceed [See blog, Inspiration, Parts I-IV]. The same general plan you used in a previous work can be used with a different twist to create a new composition; you don't have to come up with an entirely different way of handling the thematic material once you've hit on a plan that works. Let's begin, therefore, to cast aside doubt and fear if we haven't already and write a Choral in D Major to be paired with a fugue that's already, or soon to be, finished in the same key, such as Fugue in D Major Op. 18. There's no reason why the same general plan and manner of handling the 2 themes used in Choral in d minor Op. 9 [See menu bar, Free Stuff] could not be used here, with whatever modifications suggest themselves, as a general guide to develop this or any other similar work [See blog, Getting Started With Writing, Part III]. 7) a quiet coda of 4 bars with the texture expanding to 5 voices using a double pedal rounds out the piece. Obviously, if the work has 2 themes which are combined at the end, the final or combinatory section of the work will need to be worked out and written first. We can start with a theme that makes a tuneful and arresting melody, then invent another melodic line that moves in mostly contrary motion to and makes consonant harmony with it, keeping perpetual 8th note motion when both themes are combined. This 2nd melody may not be as tuneful or interesting as the 1st one, but it's chosen for its blending qualities and will become our 2nd theme. The student will note that throughout this paired work there are 11 measures where 2 different melodic lines pass each other at a "near miss" minor 2nd interval (or its dissonant cousin, a minor 9th), which adds a little "sparkle" and unexpected ear-tickling effect, which in turn creates additional interest [See blog, Getting Started With Writing, Part XXI, Do The Unexpected]. 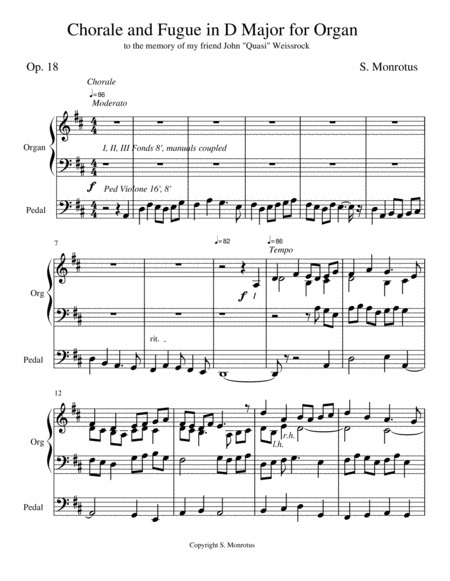 The Choral proper, of 54 measures, took only 2 days to compose; its paired Fugue of 68 measures took just 3 days, making the entire Choral and Fugue in D Major Op. 18 only a 5 day venture [See blog, Getting Started With Writing, Part XIV]. All it takes is a notebook PC, some online music writing software, suitable thematic material and a plan which enters our head as we're working, and the resolve to sit down and do it in little bits every day. The hardest thing about composing music is making it a point to sit down for a little while every day like this, and do our work. Because it's about power, love, and purpose: 3 things our broken society, and our broken world, desperately need [See blog, Organ Music Unites].